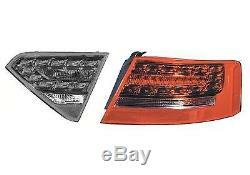 Exterior rear led light audi a5 coupe / cabriolet 06 / 2007-08 / 2011. Rear light audi a5 - passenger right - for rear wing - led - complete with electric part. Replaces the original reference (s): - 8t0 945 096 d - 8t0 945 096 b. For models: - audi a5 coupé (3 doors) from 06/2007 to 08/2011 - audi a5 cabriolet (3 doors) from 03/2009 to 08/2011. Cote-auto-pieces: specialist in the sale and shipment of new body parts by internet since 2009. Cote auto in a few figures! 30,000 pieces of bodywork online. 10 sizes of different cartons. 8000 fans on our facebook page. 9 years of experience and satisfaction (it matters;). 4 European suppliers exclusively specialized in bodywork. + thousands of satisfied customers who come back after years of serious and cooperative work. Conditions and delivery times auto-parts rating. Delivery time 3 to 4 working days. Invoice provided with VAT in the package. New body parts (adaptable) equivalent to the origin. A break is always possible, in this case you are notified the same day or the next day by telephone, with a delay provided by our supplier or proposed immediate refund. (if you want to make sure before the piece is in stock you can send us a message or contact us by phone) thank you for your understanding. Off weekends and public holidays. For any questions or requests please. Customer service by phone 10h / 17h from Monday to Friday 0320682757. The item "back led light right outside audi a5 coupe / cabriolet 06 / 2007-08 / 2011" is on sale since Tuesday, June 14, 2016. It is in the category "auto, motorcycle parts, accessories \ auto \ spare parts \ optics, lights, turn signals \ taillights, braking". The seller is "auto-parts-rating" and is located in / in tourcoing. This item can be shipped to the following country: France.